The work of Ivan Nikitin played an important role in the establishment of eighteenth century Russian portraiture as an artistic phenomenon of not merely national but also European significance. This fact became abundantly plain at the International Portrait Exhibition mounted in the Pushkin Fine Arts Museum in Moscow in 1972. Nikitin’s life is poorly documented. He was born about 1680 in the family of a priest in Moscow, and received what was for those days a good education: he could read and write Latin, knew grammar and learnt mathematics, and at one time even taught arithmetic and drawing at the artillery school in Moscow. He received his first artistic training in the typographical school at the Armoury. Nikitin’s passion for painting reached the ears of Peter the Great, who arranged for him to study under Gottfried Danauer, a painter who had come to Russia in 1711 and, like all foreigners, pledged himself to ‘teach the Russian people all he knew himself’. Under Danauer, Nikitin began studying the laws of perspective and painting skills; at the same time he helped Danauer carry out commissions. Nikitin’s first teacher of drawing is considered to be the Dutch etcher Adriaan Schoonbeeck. One of the young Nikitin’s first independent works is his portrait of Praskovia Ivanovna, the niece of Peter the Great (RUSSIAN MUSEUM, St.Petersburg), which was signed by the artist and dated 28 September 1714. The work still exhibits the immobility of the late sixteenth-seventeenth century Russian parsuna (Parsuna (cf. ‘person’): the first Russian portraits, though they had certain features of secular art, such as individualised portrayal, were still very much under the influence of earlier paintings of saints) and an inability to convey the play of light. But the likeness of this attractive girl betrays the artist’s desire to attain more than mere external similarity, for he reveals, and poeticises, the inner world of his model. Before travelling abroad Nikitin painted several more portraits, including those of Natalia Alexeyevna, Peter the Great’s favourite sister (Tretyakov Gallery, Moscow) and of the Cossack in a red kaftan (1715, Kharkov Art Museum). They are all marked by the artist’s desire for realism and by his thoughtful approach to the characterisation of each personality. 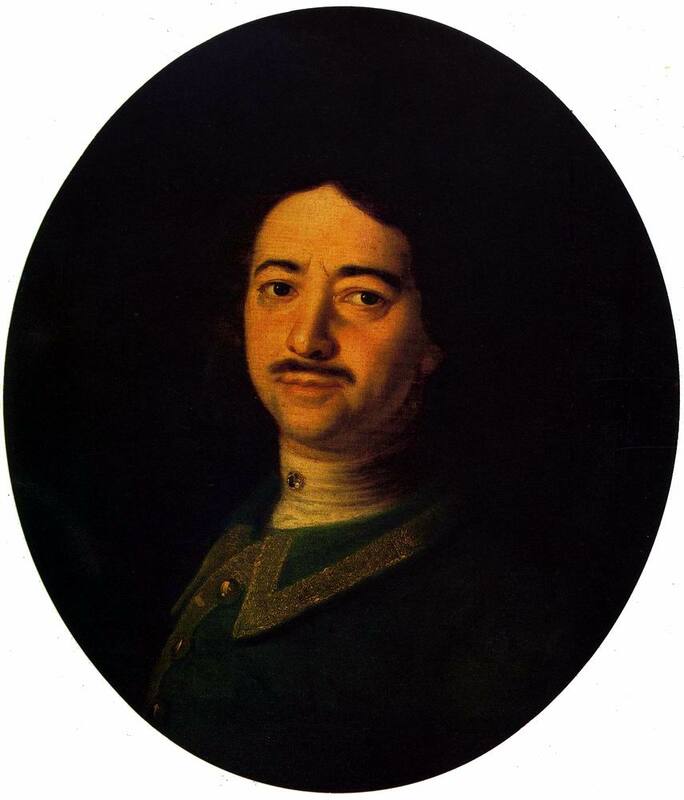 In his notebook for 1715 Nikitin wrote that he had painted ‘His Majesty in profile’, and there are grounds to believe that the portrait in question is that of Peter against the background of a sea battle (now in the Yekaterininsky Palace Museum in the town of Pushkin near St.Petersburg). The portrait had previously been considered the work of Danauer or Karavak, but it is considerably more expressive than their other paintings. The person referred to as the ‘match-maker’ was the Chancellor, Count Golovkin, who acted as match-maker at the wedding of Peter’s niece Yekaterina Ivanovna. 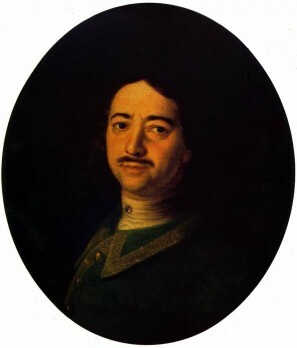 Nikitin painted his portrait later, in the 1720s (Tretyakov Gallery, Moscow). The portrayal of Golovkin combines his individual characteristics with an expression of his importance as a statesman, who — according to the inscription on the reverse of the portrait — concluded 72 treaties with foreign governments during his life. When Nikitin arrived in Italy, the Russian ambassador Beklemishev helped him enter the Venice Academy of Arts. About a year later the Russian ‘pensioners’, as they were known, moved to Florence where at Beklemishev’s request they were taken under the personal wing of the Grand Duke of Tuscany, Cosimo III Medici. Classes in painting were given by Professor Tommaso Redi of the Florence Academy of Arts, and Nikitin’s artistic development was also greatly influenced by the works of the great Italian masters. At the beginning of 1720 the Nikitin brothers returned to St.Petersburg, bringing with them letters and certificates from Beklemishev and the Grand Duke of Tuscany, which included glowing reports on their successful studies. Peter met his ‘pensioner’ warmly. He awarded him the title of ‘master portraitist to the Tsar’s court’, gave him a house not far from his palace and recommended his courtiers to have their portraits done by him. Nikitin was to be appointed director of the planned Academy of Arts. The numerous portraits painted by him upon his return from abroad speak eloquently of the maturity of his talent. The authentication of Nikitin’s works is a tricky business, for only three of them are signed. Among the portraits assigned to Nikitin is the circular one of Peter the Great (RUSSIAN MUSEUM, St.Petersburg), one of the best portrayals of the tsar made in his lifetime. 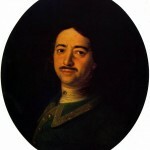 It is possible that this is the portrait mentioned by Peter in his diary for 1721: ‘On Kotlin island before mass His Majesty was painted by the portraitist Ivan’. Although this is a small-scale work, Peter comes across as a great statesman and as a man of enormous inner strength. 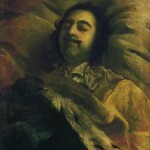 The same understanding of the tsar’s personality was seen in the official portrait of Peter the Great on His Death-Bed (1725, RUSSIAN MUSEUM, St.Petersburg), which Nikitin was given the task of painting. Time was short, and the portrait was painted in large, fluent strokes. Both in this expressive manner of painting and in the unusual angle from which Peter is depicted (from above), one can sense Nikitin’s great artistic and compositional skill and his deepfelt attitude towards his subject. The Field Commander (1720s, RUSSIAN MUSEUM, St.Petersburg) is a masterpiece of Russian portraiture. This is an appealingly humane depiction of an anonymous associate of Peter’s. He is stern and fearless, and his features bear the mark of years of tribulations. His intelligent eyes gaze intently from under his grey brows. The open composition seems to act directly on the viewer, and the simple colours are restrained and expressive. Russia’s military victories are reflected in various battle-pieces ascribed to Nikitin, e.g. The Battle of Poltava (1727, not preserved) and a picture of The Battle of Kulikovo (RUSSIAN MUSEUM, St.Petersburg), in which the artist partly employed the composition of an etching by the Italian Antonio Tempesta—while the protagonists, of course, are taken from Russian history. A large signed work, entitled Family Tree of the Russian Tsars (RUSSIAN MUSEUM, St.Petersburg), dates from 1731. Its composition is stylised and suggests a conscious return to the traditions of the seventeenth century. This is significant in the context of artist’s career. Soon after Peter’s death, as a result of the changes in the political situation, Nikitin’s world outlook underwent substantial modification. 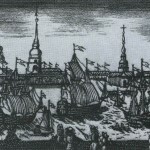 Nikitin grew closer to the Moscow old Russian opposition, and early in the 1730s he and his brother were arrested in connection with a pamphlet about the Archbishop of Novgorod, Theophanes Prokopovich. From Moscow they were sent to St. Petersburg, to the secret police headquarters, and were then locked up in the Peter and Paul Fortress. The investigation of their case dragged on for more than five years. Although Nikitin was guilty of very little, a decree of the Empress Anna Ioannovna in November 1737 ordered him to be ‘beaten with whips and sent to Siberia to live there under perpetual surveillance’. His brother Roman was also exiled. But even in these trying times Nikitin continued to paint: at the beginning of the thirties he completed a portrait of Praskovia Fyodorovna, the widow of Peter the Great’s brother Ivan Alexeyevich (now in the Zagorsk Museum of History and Local Lore). During the period of investigation, Nikitin painted the chief of the secret police, General Ushakov (Tretyakov Gallery, Moscow), who may in return have shown the artist certain indulgences. Even in Tobolsk, where the brothers were exiled, Nikitin continued to work, and the archives point to the existence of a portrait of the Tobolsk Metropolitan Antony Stakhovsky. The works known to us represent a mere fraction of all that was painted by this founder of Russian portraiture. He is also known to have painted Catherine the First, the daughters and grandson of Peter the Great, Alexander Menshikov and his family, the princes Golitsyn and Dolgoruky, and also iconostases and individual icons. Just before the death of Anna Ioannovna, the Nikitins’ case was reviewed and in 1742, on the orders of the regent Anna Leopoldovna, the brothers obtained permission to return from Siberia. The artist, who was seriously ill, died during the journey.